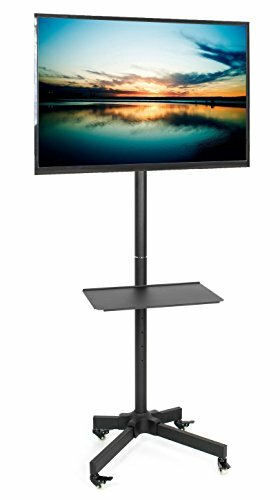 New Height Adjustable Mobile TV Mounting Floor Stand (STAND-TV04M) from VIVO, convenient for carting around your flat screen in home, business, and classroom settings. This sturdy cart mounts most flat screens from 23" to 55" and has a weight capacity up to 55 pounds. Features include height adjustment with a maximum center screen height of 58.8". The 19" x 11.5" shelf can also be adjusted from 17.75" to 27" along the center support pole. The mounting bracket has 15 degree tilting so your screen can be set to desired viewing angles. Bottom wheels come with locking to make the cart mobile or stationary when desired. The mounting bracket is VESA compliant supporting 50x50mm to 400x400mm mounting holes. Stand assembly is simple and comes with necessary tools and hardware to get your flat screen up and mounted. ADJUSTABLE FEATURES include screen and tray height adjustment and 15 degree screen tilt to find the best viewing angle. Maximum floor to center of screen height is 58.5"